I am jumping in to the blog world with both feet . I have so enjoyed reading about all the talented and creative people out there. Not that I am either of those but I do love making quilts. I have the best job in the world working for Moda Fabrics. I am a modamaniac and headed off to quilt market today but wanted to start my blog before I left. One of my favorite things to do is to make quilts combining several of the different moda designers fabric collections into 1 quilt. I have just finished possibly one of my favorite quilts ever. It uses moda’s Honey Bun strips that are 1 1/2″ wide. The quilt has strips from Fig Tree’s group , Collections for A Cause by Howard Marcus, 3 sisters, Minick & Simpson, Barbara Brackman, Terry Thompson, and more. ( How is that for practicing adding links?) The quilt may possibly be featured in a future McCalls quilting issue. Hi Lissa! A warm welcome to the wonderful world of blogging. Have fun! We look forward to hearing all your news from Moda & seeing your lovely creations. Your quilt is gorgeous – I love how so many of the Moda fabrics blend seamlessly from one range to the next. So versatile. Have a wonderful time at market. Best wishes, Bloom (Australia). Yeah Lissa!! You KNOW I’m excited. 🙂 And Moda Lissa- that is just plain clever. Glad to see you here in blogland! Beautiful quilt, by the way! Blogging is wonderful…welcome. From a fellow blogger and a Moda fabric collector, to be sure. Welcome to the blog world – I’m fairly new here myself, just a few months old. It can become addictive! Terrific! See you in a couple of hours. Welcome to blogging! I can’t wait to see the new stuff coming out of Market. Love the strippy quilt! It’s only my opinion ~ and that’s not worth much ~ but I think you should do a giveaway where some lucky recipient gets all the Honey Buns necessary to make the absolutely gorgeous quilt you just “whipped together”. And congratulations on the blog! When Moda Lissa speaks, we’ll listen. Welcome to the blogosphere!! And WOW! What a stunning STUNNING quilt!! 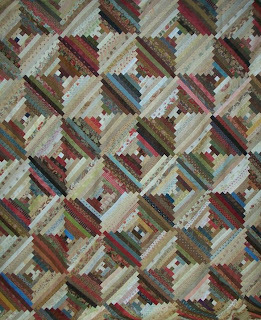 I just spent a few hours today cutting 1 1/2″ strips for a future log cabin..and PERFECT timing running across this quilt! It’s just fabulous! I love Carrie’s suggestion! go for it! Welcome! What could be better than a quilting blogger that works for Moda. Nothing! I’m looking forward to reading about all the news about Moda and all the insights you will be able to give us. Welcome! Terrific for you. LOVE your blog title and banner. I’ll be adding you to my favorites. Hi Lissa, love the name! Love the quilt and love Moda! Congrats on the new blog! Your blog name is great and so creative! I’m anxious to see all the things you will be blogging about – as you are probably the most plugged in person to my fav fabric company!! Whew – so good to be home, but was such great fun, you leave with mixed emotions. But seeing as you get so stimulated, you need to get home and get busy!! Was a wonderful market and display by all of Moda – thanks to Lissa, this is her baby – we are so lucky to be part of them. The quilt is stunning. Thanks for sharing. Yeah, another Moda-maniac! Well, I am a Moda Freak (just look at my stash)! My friend and I just came back from Quilt Market and I love all of Moda’s new fabric lines! You should have seen us at Sample Spree! Oh Lordy! Plus I love all of the Moda Home stuff. Everything was so inspiring. You have a great job and I am so jealous! I love your quilt and what you did with the Honey Buns! I may have to make the same quilt with the Honey Buns that I bought at Sample Spree. I can’t wait to see more of you work! Please email me because I have a few questions to ask you. Oh I am just soooo excited you are joining us! What fun you’ll have and such a treat for us! Give your kids and husband a hug and tell them you can’t cook because you have to blog! I love your quilt…Welcome, welcome to Blogland…you’re going to have sooo much fun here! Great beginnings…welcome to the blogging world (from a Bunny Tales reader). Love the Moda-you honored them with an excellent quilt! Welcome to the blogworld… and of course.. Moda is the best! What a wonderful place to work! Holy Cow! I didn’t even know you had a blog! Well, welcome to blog land! I am excited to read your posts – I know they will be fun! Beautiful quilt by the way! Love the quilt. And it also answers my question is what to do with Honey Buns! LOL. Great blog! Welcome to the wonderful world of blogging. I must warn that it is addictive. Wow, I’ve just come across your blog, I’ve been looking for inspiration. I aquired my first Sweet Roll/ Honey Bun last week at the Australian Quilt Market and am dying to make it up. I know its going to look gorgeous whatever I do. I’ve been thinking they will be perfect for log cabins. Your quilt looks fantastic. I just came across this quilt even tho I’ve been enjoying your posts since Christmas. Did this quilt end up being featured in McCall’s or any other magazine? Did you publish the pattern? You make it all look so easy ….I’m on a slow learning curve but love everything about quilting. Lissa, I found your blog after looking at "Bonnie Hunter's". I love this quilt. Was just wondering what size blocks that these were. This would be so pretty using some of my 1.5 inch scrap strips.